President Barack Obama visited Arlington National Cemetery on Monday to honor those who have sacrificed their lives while serving in the U.S. military for Memorial Day. 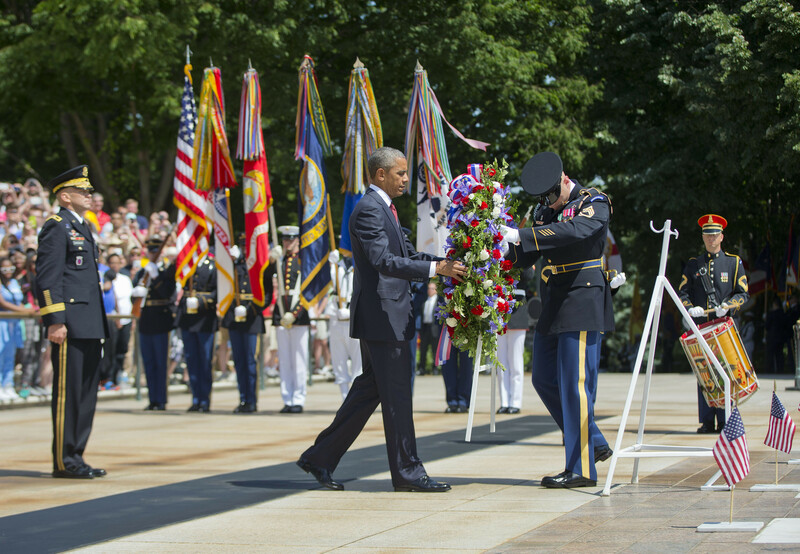 Obama laid a wreath at the Tomb of the Unknown Soldier and made remarks honoring those who have died, saying Americans "can never fully repay the debt" to those who made the ultimate sacrifice. Speaking to military officers, families of the fallen and a crowd of roughly 5,000 gathered under sunny skies, Obama noted this is the first Memorial Day in 14 years that has been observed without U.S. forces engaged in a major ground war. He described Arlington Cemetery as more than a resting place for heroes, but also a reflection of America itself, including its history and diversity. "Most americans don't fully understand the sacrifice of the 1 percent of those who serve in our armed forces," Obama said. "Few know what it’s like to take a bullet for a buddy, or to live with the fact that he or she took one for you," he added. Defense Secretary Ashton Carter and Joint Chiefs Chairman Martin Dempsey also spoke at the event. “I want you to know that you are always in our hearts," Dempsey said to veterans in the crowd.